The new OnePlus 3T is a respectable if not earth-shattering update to the alternative flagship - see Ryan Whitwam's review for the full breakdown of the new phone and how it compares with the original OP3. It went on sale in the US last week, but now buyers in Europe also have a chance to get their hands on one. It's straight sales all the way - none of the ticket systems that OnePlus used to indulge in. Prices in the region are generally equivalent, though various factors make them more expensive in local currency versus US dollars after conversion. The 64GB model is £399 in the United Kingdom, or £439 for a 128GB upgrade. All countries with Euro currency can get the phone for 439€ and 479€, respectively. It's 4,395 or 4,795 krona in Sweden, and 3,299/3,599 krone in Denmark. To introduce the faster, longer-lasting 3T in Europe, the company hired a fighter pilot and what looks like a Czech-made variant of the Cold War-era MiG 15. 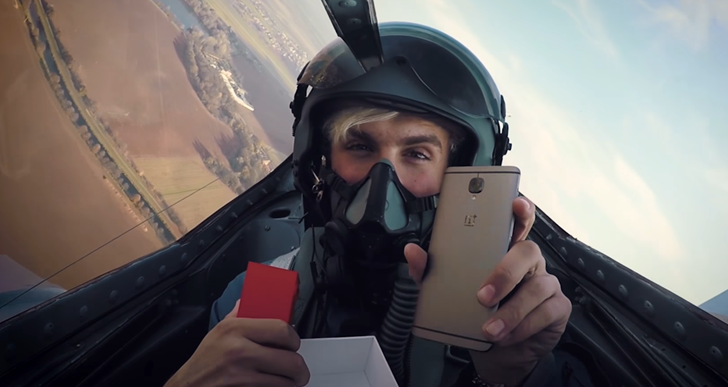 The demonstrator is sitting behind the pilot with a retail OnePlus 3T box, and he proceeds to do a standard unboxing video while the pilot tries to make him pass out with the vigorous application of Gs. Yeah, it's a little hokey, but it looks like fun... and it's far from the worst piece of marketing that OnePlus has created.